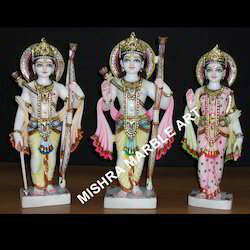 We offer an exclusive range of Ram Sita Darbar Colored Idols that depict lord ram along with his wife goddess sita and younger brother Laxman. In this statue, lord Hanuman is also sitting near the feet of lord ram in a humble position. Our range of statue is ideal for worshiping and makes the surrounding peaceful. 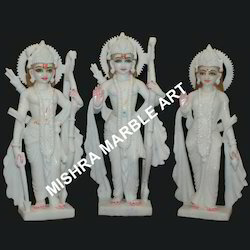 We are manufacturers and suppliers of an exclusive collection of Marble Ram Darbar Statue. 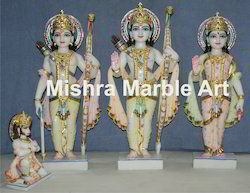 These statues depicts lord Ram with his wife goddess Sita and brother Laxman. Furthermore our statues are ideal for placing in temples. 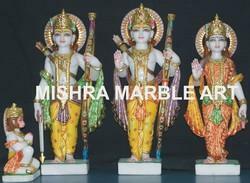 The ornaments and accessories of our statue is crafted by our experts that make it more colorful and attractive. 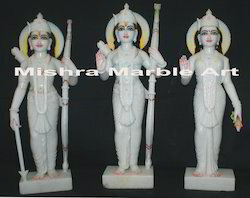 With the help of our experts, we offer a comprehensive range of Ram Sita Laxman Idol. These are crafted using quality marble and advanced technique. We provide this statue with Sita and Laxman. 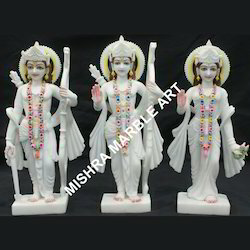 Our organization holds expertise in providing a wide collection of White Marble Ram Darbar statue to our clients. 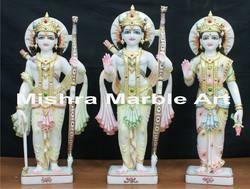 These statues are crafted using white marble and acknowledged for the smooth finishing. Our range of statue is ideal for keeping in god room. Furthermore our range finds huge demand in the both domestic and international market. We offer an exclusive and wide range of Ram Darbar Moorti. One of the most popular in our range of Ram Darbar occupies a pride of place among all our offerings. With the stunning representation of ram ,Sita and Lakshman on either side and Hanuman sitting on the ground in a regal posture, truly represents the mastery of the artisan. This master piece in white marble is replete with attention to detail and makes the stone sculpture appear most life like. Ram Darbar statues with pure gold leaf painted like jari works on dresses makes the idols most resplendent. we source the white marble from most trusted vendors in the industry. 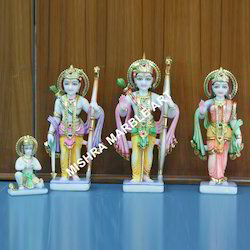 We offer an exclusive range of Ram Sita Darbar Colored Idols that depict lord ram along with his wife goddess sita and younger brother Laxman. In this statue, . Our range of statue is ideal for worshiping and makes the surrounding peaceful. Looking for Ram Darbar Moorties ?